This has fantastic implications for holiday shopping as well. Prior to the launch of the single checkout, Gap did allow customers to create one account that worked for all of its properties (one login and password), and showed text links to the other stores across the top of each store’s design. 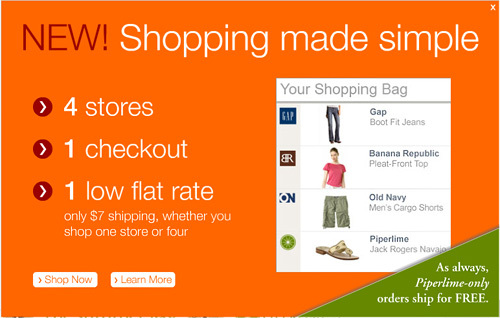 The new tabs bring a unified feel to the sites, and the single checkout provides incredible convenience. It will be interesting to see if Gap experiments with cross-selling and up-selling between stores. Because each store with the exception of Piperlime (shoes) targets a different price-point, mixing $5 Old Navy recommendations alongside $180 Banana Republic garb may not fly. But certainly Piperlime cross-sells make sense – shoes and accessories are natural add-ons to any purchase. Unifying the checkout only makes this much easier to do. Previous article8 Google Analytics Sins: Are You Guilty?